Talk to your doctor about flying with oxygen and if you are an adult that can use a pulse delivery device. Is oxygen needed to sleep with at night on this trip? 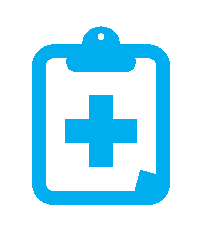 Determine your oxygen requirements prior to booking your travel. 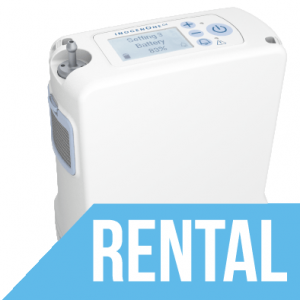 For us to provide a rental Portable Oxygen Concentrator, we need a copy of your doctor signed prescription for oxygen with the flow rate included, ex. 2 Lpm. It can be faxed to us at 757-481-2874 or emailed to info@aeromedic.com. Each airline has there own rules about required extra battery time. Most airlines are 150% of the flight time to equal the battery time. Some airlines count time at the airport as well. We can help you determine how many extra batteries are needed, call us at 1-800-346-3556. We can help you pick a POC that works best for your trip. Check out the different units we provide here. After you pick a unit, we will create a rental agreement based on your travel details. 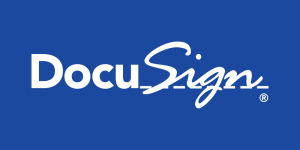 We use Docusign for you to electronically sign the rental agreement and securely pay online using a mobile device or a computer. We use FedEx to ship a POC from our office in Virginia Beach, Virginia. It will arrive to you ready to go with all required batteries and accessories needed for your trip. 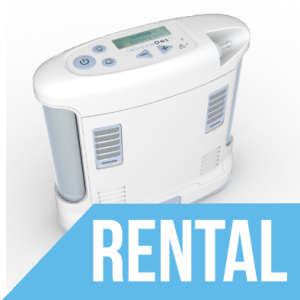 We are available 24/7 for instruction on the device rented as well as any support needed for the duration of your rental. 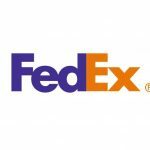 Drop off POC with FedEx at a location nearby or schedule a pickup. 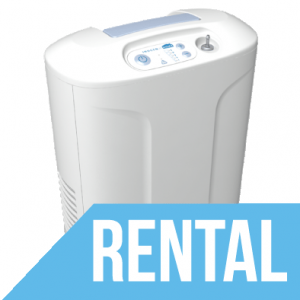 Using the enclosed shipping label, it is easy to return the rented portable oxygen concentrator. Only FAA Approved Portable Oxygen Concentrators are allowed on commercial flights for therapeutic oxygen needs. No cylinders or oxygen tanks are allowed on any US Airlines. No Liquid Oxygen Portable Units are allowed to be used on any US airlines. 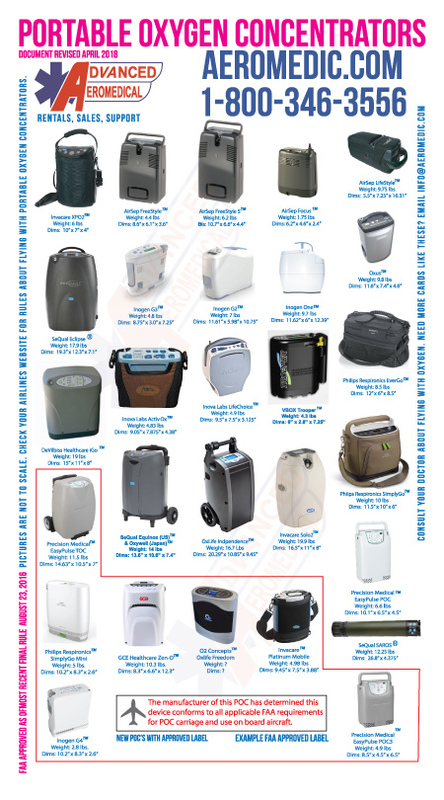 Your source for FAA Approved Portable Oxygen Concentrators. We offer sales and rentals for people traveling with in the US as well as International Travel. The patients needs come first. Let us know the specific oxygen requirements, we will let you know all the options available. We are an information resource, we want people to be educated about traveling with oxygen. Give us a call at 800-346-3556 or +1-757-481-1590 to speak to a representative and get your questions answered. Send us an email at info@aeromedic.com with your travel details and oxygen needs, we are here to assist. 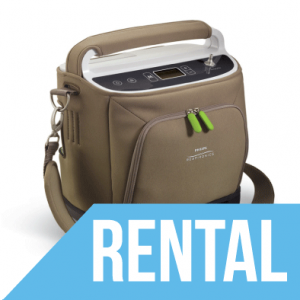 As of August 23, 2016 it is now easier for people to travel with a portable oxygen concentrator. The newest FAA ruling eliminates the need for a doctor signed physician statement, previously required by all airlines. As of August 23, 2016 some airlines still require a specific airline physician statement, call your airline and ask a customer service representative for the up to date rules. A prescription for oxygen is still required by the US Food & Drug Admistration to obtain a portable oxygen concentrator. 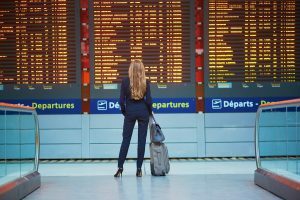 Some airlines still require notification via telephone or passenger signed document prior to travel, see your airline’s website for updated rules and regulations. Flying with a Portable Oxygen Concentrator relies on the use of battery power. Each unit has its own battery with different battery duration times at different flow rates of oxygen and delivery methods. Most airlines require 150% of the fight time to equal the battery time. Some airlines require travel time +3 hours, including any stops along the way. Refer to your airlines battery requirements on there website or call there customer service. 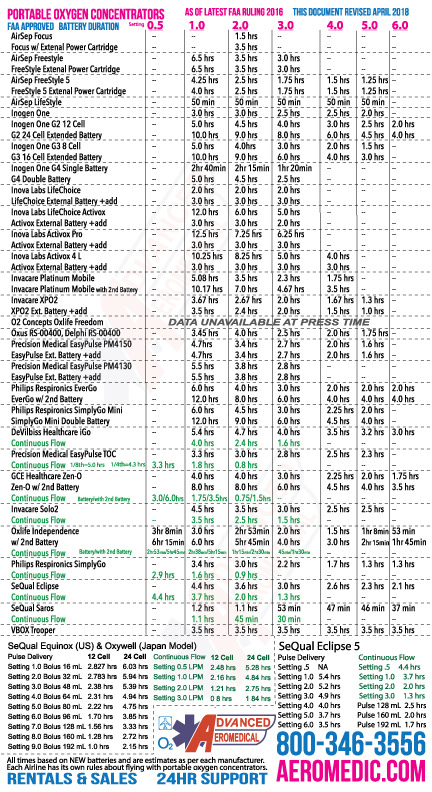 Check out our NEW FAA Approved Portable Oxygen Concentrator Reference and Battery Duration Chart! If you would like these postcard size cards sent to you or your organization, send us an email at info@aeromedic.com. NEW cards updated April 2018!